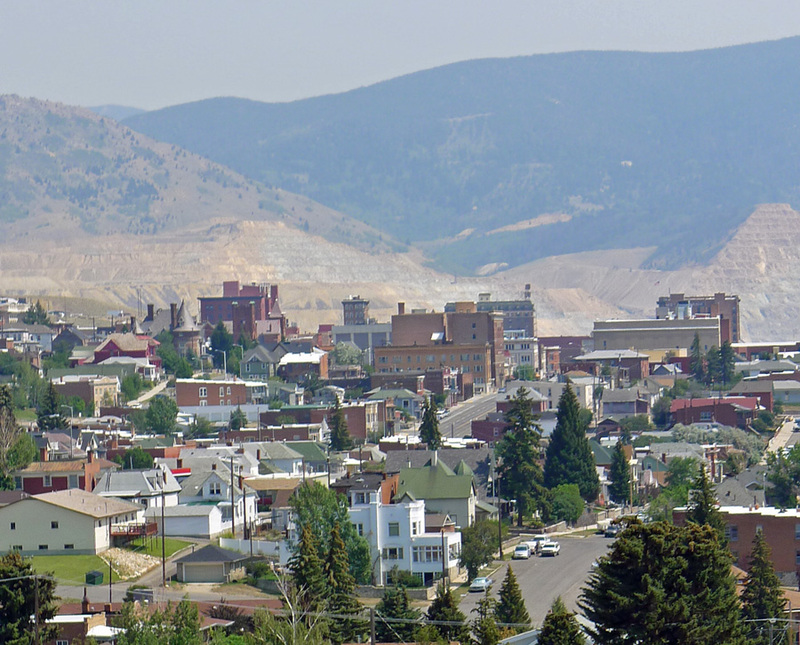 View from the Mining Museum; Butte downtown sits at the edge of the Berkeley Pit (polluted former copper mine is now a Superfund site). The Copper Barons made a killing in Butte. The amputated “Richest Hill on Earth” is now gone, replaced by a pit full of toxic water that is rising daily as drainage from the Horseshoe Bend Seep pours into the pit from an overtaxed water treatment plant. The Horseshoe Bend Treatment Plant sits above the waters collected in the Berkeley Pit. The Horseshoe Bend (HSB) water treatment plant (WTP) did not meet the final pH effluent standard. Effluent is currently recycled to the Montana Resources (MR) mining operations and does not discharge to Silver Bow Creek. But, on the day we visited the site waste water appeared to be flowing directly into Berkeley Pit. Let’s look more closely at the left of the treatment plant. Polluted waste water flowing into the Berkeley Pit from the HSB Treatment Plant, Aug. 2012. More than 100 years of mining have resulted in the development of over 500 underground mines (with roughly 3,000 miles of underground workings) and four open pit mines, including the Berkeley Pit with its ancillary tailings ponds, waste dumps and acid leach pads. Operation of silver mills and copper and zinc concentrators/smelters in Butte resulted in the production of a variety of mill and smelter wastes, including particulates (aerial emissions and tailings). The long period of mining in Butte left the landscape littered with un-vegetated or sparsely vegetated mine wastes, often containing hazardous concentrations of metals and arsenic. These wastes represent significant sources of environmental contamination to Silver Bow Creek and posed human health and risks to the environment. At least Silver Bow Creek has been improved and toxic flows into the Clark Fork River have been controlled. 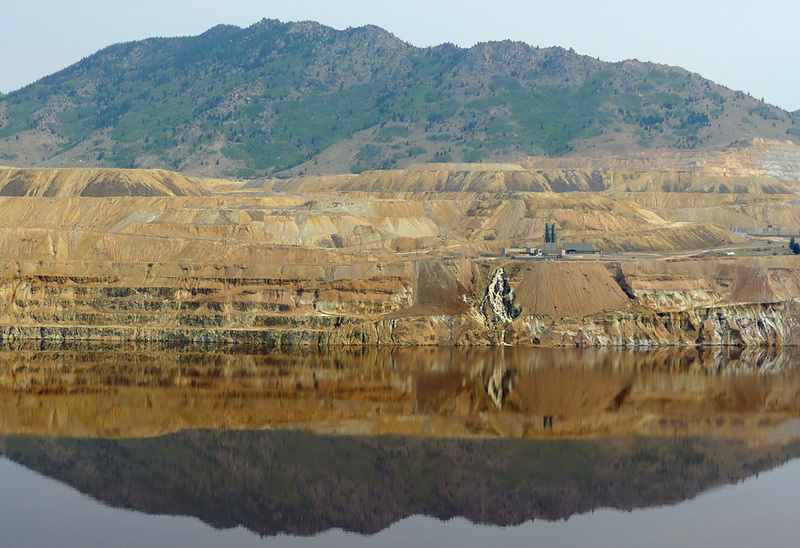 Sadly, Berkeley Pit is just one example of the environmental impact of open-pit mining. No one knows what will happen when the level of the Pit Lake reaches the level of the ground water aquifer. This entry was posted in Montana, Travel Blog and tagged Berkeley Pit, Butte, Montana, Postaday, Superfund Sites, Toxic Waste, Travel, Vacation, Water Pollution by carto. Bookmark the permalink.